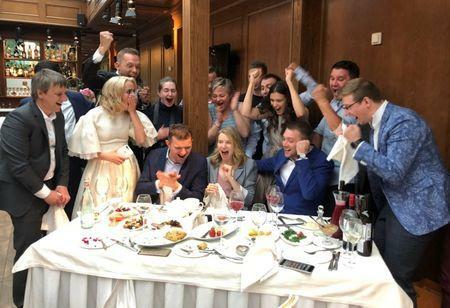 Their wedding ceremony -- in a town outside St Petersburg -- started at 1400 GMT, the same time as the Spain v Russia match kicked off, and the guests kept track of the score in a Round of 16 tie that ended 1-1 after extra-time. The room erupted into wild celebrations as Akinfeev's save secured a 4-3 shootout win for Russia to confirm the host's spot in the last eight. "It's the best gift ever," the groom, who is a soccer fan and amateur player himself, said.